Today I want to introduce you to Frisella, also called Frisa, Frisedda or Spaccatella, depending on the dialect spoken. What could have been the ancestor of a bagel today, comes from southern Italy, particularly from Puglia, but is also found in Calabria. Yes, you have seen correctly, this bread is dry, I mean really dry. No way you can just bite into it! That’s because it originates from a time where baking wasn’t an everyday thing, so when the farmers would bake their breads, they would make most of them to last at least until the next baking session. So they doubled baked their breads to make them dry and therefore long term lasting. Fun fact about it’s particular snake or donut form, that had a very practical reasons: friselle were commonly eaten when travelling and the hole in the middle allowed to tie them on a rope like a necklace for easier transport! Ok, let’s move on to the culinary aspect: friselle are best eaten with fresh tomatoes. But even the most watery ones wouldn’t be enough to soften them. So you will need to dip them in some water before topping them. And here comes my favourite part of the story (that’s why I really wanted to tell you about this simple dish): the fishermen used to take their friselle on their boats and they would dip them in sea water to soften them. I know, not something we are willing to do now. But isn’t it really poetic? And can you imagine the lovely salty sea taste they would get with sea water? Well, back to today and to our unfortunately polluted seas.. Let me show you how to transform this simple breads into an amazing dish. All of them are seasoned with a good salt, extra virgin olive oil and red wine vinegar. No particular recipe today. Just make sure to wet your frisella and to top it with high quality and super fresh ingredients! Those were hand picked in my mother’s veggie garden – doesn’t get fresher then that!! You can also use friselle on the bottom of your (fish) soup, just like the fishermen used to do when they would go fishing for several days. 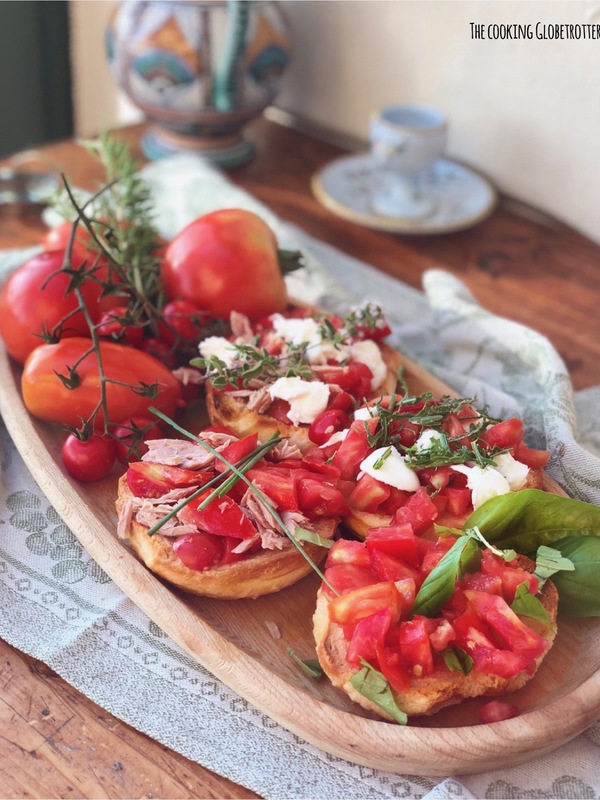 If you can’t find them, just use you favourite bread (maybe my herby quark buns) and your favourite vegetables to make a simple and delicious summer meal! !